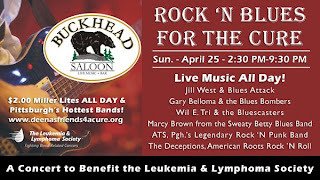 I don't always post events that are promotions of causes as an article on Baby Boomer Davy's Locker, but this is a great local music event in the South Side of Pittsburgh, PA this weekend to listen to some tunes and give to a great cause. If you're a reader of Baby Boomer Davy's Locker and in the Pittsburgh area, check out any of these worthwhile events. If you are not in the area and still want to donate to the cause that benefits the Leukemia & Lymphoma Society, you can do so from the link below as well. Sun., April 25, 2010--2:30 PM-9:30 PM. Rock 'N Blues for the Cure Benefit Concert at Buckhead Saloon at Station Square. $20 Tax-Deductible Donation. Free Massages courtesy of Spa-Nique! 50/50 Raffle & Door Prizes! Thurs., May 6, 2010--6 PM Happy Hour. 7 PM Dinner. Seis de Mayo for the Cure! Mexican Dinner at Emiliano's in McIntyre Square Mall, North Hills, Pittsburgh. Click Here for Google Map. Happy Hour at 6 PM in the upstairs bar. All-You-Can-Eat Dinner Buffet from 7-9 PM in the private patio room on the main level, near the front door. Sat., May 8, 2010--8 PM-11 PM--Party for the Cure! Food, Beer, Wine & Live Music. Irma Freeman Center for Imagination, 5006 Penn Avenue, Pittsburgh, PA 15224. Great Food, Great Drinks, Great Music for a Great Cause! Contact me if you'd like to become a sponsor. Voice: 412-202-8908. Tues., May 11, 2010--7 PM--Wine Tasting & Dinner for the Cure! Wine Tasting & All-You-Can-Eat Dinner Buffet. Joey D's 2801 Freeport Rd., Harmarville, PA 15238 Wine & Dinner included for $20 donation. Meat & Vegetarian options available for the buffet. Due to limited space for this event, you MUST REGISTER & PRE-PAY on the Grape Thoughts web site to reserve a spot. Click Here to Register & Pre-Pay on Grape Thoughts. Contact me if you'd like to become a sponsor. Voice: 412-202-8908. Sat., May 15, 2010--4 PM-11 PM--Fill the Mug" Charity Bar Crawl. Starts at the Library Restaurant & Bar, 2302 E. Carson Street. Touring South Side Bars. $10 Donation until April 30th. $15 from May 1-15th. Shiny yellow beer mugs for all participants and cool raffle prizes! Contact me if you'd like to become a sponsor. Voice: 412-202-8908. Fri., May 21, 2010--6:30 PM. Grand Finale Gala Party at Bobby Rahal Automotive Group in Wexford, PA. 15035 Perry Highway Wexford, PA 15090. Tickets for the Grand Finale Gala Party are $50 each, and can be purchased online. The party will feature a cocktail reception, hor d'oeuvres, a silent and live auction, and a reverse rafflefor a brand new 2010 Mercedes Benz C300 AWD! Raffle tickets for the car are $150 each, and include admission for two to the Grand Finale Gala Party. (Winner need not be present.) Only 500 tickets will be sold, so each raffle ticket has a 1 in 500 chance of winning!